OK, there are baked beans you make from scratch. You know, soak the beans overnight, then combine them with some pork and molasses and slow braise them in the oven for hours until the aroma drives you crazy enough that you grab the pot (before they’re done!) and start dipping your spoon in. Pretty good. But not as good as these shortcut beans. My recipe starts with canned baked beans (don’t tell!) Then you add some bacon and barbecue sauce, plus other goodies. Time in the oven? No more than an hour. Time before the aroma drives you wild and you grab the pot of beans (without an oven mitt!) and start spooning them down? Half an hour — 45 minutes tops. Fortunately, this is a pretty easy recipe to make. But you don’t have to tell them that. In some parts of the world, people enjoy eating baked beans straight from the can, no flavor enhancement expected. That’s exactly how they serve them for an English breakfast. At tea time they serve the baked beans on toast — but still straight from the can. Not for me. I want flavor, and lots of it. So I always pep up canned beans with some goodies — which manage to transform this somewhat plebeian dish into gastronomic royalty. Although I vary both the ingredients and their quantities almost every time I make this recipe, I follow the general template I learned from my mother years ago. (OK, who are we kidding? Decades ago!) I’m not sure exactly where she got the recipe, but various renditions of a similar dish have been included in The Joy of Cooking for at least the last 4 or 5 editions. This recipe serves 8 or so. It’s easy to double or triple if you’re feeding a crowd. Preparation time is 20 minutes; cooking, an hour (largely unattended). These beans usually taste better the next day (after being stored in an airtight container in the refrigerator). Leftovers will keep a few days in the fridge, and they store well in the freezer for a couple of months. In fact, I often make a huge batch for Memorial Day, then freeze leftovers for July 4th and Labor Day cookouts. Slice bacon and place in cold frying pan. Put pan on medium to medium-low heat, and sauté bacon until brown and crisp (8 - 10 minutes once the pan is up to heat). Meanwhile, peel and dice onion (dice of ½ inch or a bit less), celery, and green bell pepper. Wash jalapeño pepper and cut lengthwise. Use a teaspoon to scoop out the ribs and seeds (be careful, the oil on these is hot; keep fingers away from your eyes). Chop into very small dice. Add to the bowl, and then wash your hands with soap and water to remove the hot jalapeño oil from your skin. When bacon is crisp and brown, remove from frying pan with a slotted spoon and set aside on a small plate. Add the diced onion, celery, green pepper, and jalapeño to the frying pan, salt and pepper to taste, and sauté over medium-low heat until soft but not brown (5 minutes minimum; usually a few more than that). Meanwhile, open cans of beans and dump contents into a 3- or 4-quart Dutch oven with cover (or another similarly sized casserole). Add barbecue sauce, brown sugar, and optional hot sauce and/or cayenne. Stir and taste. I often add more barbecue sauce at this point (I really like the flavor). If the sauce is too hot for your taste, add more brown sugar — the sweetness helps tone down the heat. When the onion, celery, green pepper, and jalapeño are soft, add them to the baked bean mix. I always include the bacon grease (you may prefer not to, although the flavor won’t be as good). Add the reserved bacon pieces and stir the mix to combine all ingredients. Taste, and add more barbecue sauce, brown sugar, etc. if needed. Salt and pepper to taste. Place covered in oven and set timer for 30 minutes. When timer goes off, uncover baking dish and cook for another 30 minutes (an hour total). After an hour, the baked beans are cooked. Serve immediately; or wait at bit and serve them warm; or wait longer and serve them cold (they’re good all 3 ways, though I think they’re best hot). When hot, the beans can be a little soupy; you may want to use a slotted spoon to serve, particularly if you’re using paper plates for your cookout. Any brand of tomato-based barbecue sauce that you like will work in this recipe. In St. Louis (where I live), Maull’s is the best-selling barbecue sauce, and it works well. It has a slightly sweet taste with just a bit of spiciness. But Maull’s is not distributed nationwide, so you may not be able to find it in your market. An even more flavorful choice might be Stubb’s, which is widely available (their spicy is particularly good). When I can get it, I also like Gate’s Barbecue Sauce, which is produced by chain of restaurants in Kansas City. Gate’s isn’t particularly sweet, so if you use it, you might find you’ll prefer a bit more brown sugar. The amount of brown sugar you use depends on how sweet your barbecue sauce is. That’s why tasting in Steps 6 and 7 is critical — at this point you’ll know if the flavor is unbalanced. Tasting in Step 7 also is important so you can add the proper amount of salt and pepper. If you don’t like barbecue sauce, you can substitute ketchup (which is how my mother always made this dish). I don’t think the flavor is nearly as good, but many people enjoy it that way. Some people also like to include molasses, cider vinegar, and/or mustard (either the powder or the prepared kind) in this dish. I’ve made it that way and it’s good; but I prefer my current recipe. If you want to experiment, you might begin with a couple of tablespoons of molasses, ¼ cup of cider vinegar, or a couple of teaspoons of mustard powder. Taste as you add your ingredients to make sure you’re liking the result. An alternative version of this dish calls for leaving the browned bacon pieces whole (after you assemble the beans, you lay the bacon pieces on top before putting the dish in the oven). But IMO, this dish tastes much better with the bacon mixed in. Yet another version of this recipe calls for topping the beans with frankfurter slices (put them on top of the beans right before putting the beans in the oven). The beans-and-franks version is intended to be a weeknight main dish, rather than a cookout side. But you may find the idea appealing. Really, feel free to adjust quantities and ingredients to suit your individual taste. I rarely cook this recipe exactly the same way two times running. 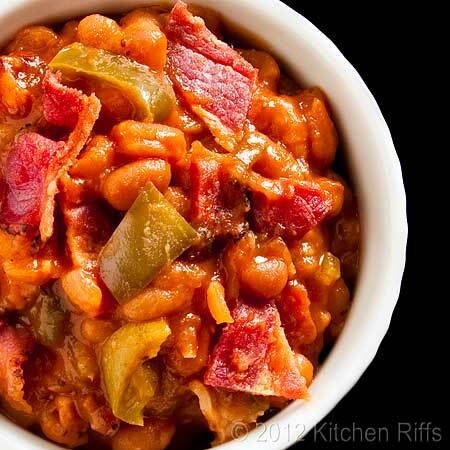 Although these Baked Beans with Bacon are great any time of year, I usually prepare them only during cookout season — from Memorial Day to Labor Day. In fact, the pictures in this post were taken late last summer. Because I won’t have another photo opportunity until Memorial Day, when I’ll make this dish again. Good decision. Bring on the cocktail umbrellas! Aha! My dad was the master at doctoring baked beans and he seems to have taken a few tips from Kitchen Riffs! I can't think how often I've been disappointed by homemade baked beans and so have taken to messing with canned beans myself -- although, it must be said, with less deliberation than here! Hi Alanna, a lot of homemade baked beans are the austere New England version — good, but their flavor profile is a bit narrow. As you can see, I like a wider gamut of flavor in my baked beans. I should check your two blogs to see if you have your father's recipe posted — I'll bet I'd learn something! Thanks for commenting. Hi Choc Chip Uru, I've actually had leftovers of this dish for breakfast! A really late breakfast, but breakfast nevertheless. ;-) Thanks for your comment. It's barbecue season - hurray!! Loving the sound of beans and bacon. I found my way here via Orgasmic Chef...and glad I did! Congrats on a great interview. Cheers! Hi Jay, it is! ;-) Thanks for commenting. Hi Wicked Noodle, glad you found me! Thanks for the kind words, and the comment. I'm embarrassed to say I've never made homemade baked beans but have always wanted to. I love baked beans and even had some tonight. Thanks for sharing this recipe. I'm going to give it a try. Hi Vicki, these are pretty good - I think you'll like them. And they're really no trouble to make. Thanks for taking time to comment. Kudos to you for cooking baked beans from scratch! I'm ashamed that I've not cook any homemade baked beans before. Hi Zoe, well, this version does use a shortcut, but the flavor is terrific! Well worth making. Thanks for your comment. Your beans look as good as any slow cooked version I've ever had. Why not shave some time off - we're all so busy these days. 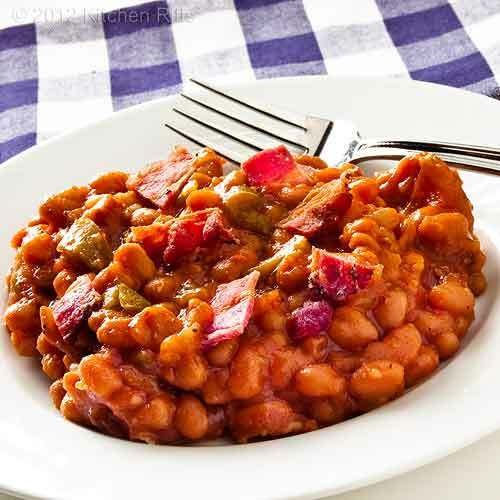 Hi Mother Rimmy, I've done baked beans both from dried beans and starting with canned, and with the flavor profile I like (the one presented in this recipe), I can't tell the difference flavor-wise. The dried beans do have slightly better texture, however; but slight is the operative word. Thanks for taking time to comment. These look terrific. My mom has a similar recipe except she uses ketchup. You've really intrigued me with the barbecue sauce, and I think I'll be serving this in our back yard this summer! Hi Beth, yup, my mom used ketchup too. But barbecue sauce adds a whole new dimension, IMO. Hope you enjoy it! Thanks for stopping by. What a nice comfort dish! I love beans but not the rest of my family so I rarely make this kind of bean dish. Your delicious photo made me realized how much I actually missed eating this! Hi Nami, too bad your family doesn't like beans! This dish might get them liking them - but perhaps not. They don't know what they're missing! Thanks for your comment. Oddly, I've never made my own baked beans but being originally from Boston, I love them so much! Yours look absolutely mouthwatering. Hi Georgia, these are a little spicier than most Boston Baked Beans, but otherwise pretty similar. Thanks for taking time to comment. Baked beans are usually my favorite part of a bbq. And, the aroma while they cook is amazing! WOW - look at all that bacon! Definitely deserves to be in the title! I love baked beans but very seldom have the patience to make them from scratch, so this recipe is right up my alley. Thanks for developing a baked bean recipe for lazy cooks like me! They look delicious! Hi Lisa, me too! In fact it's the rare BBQ when the baked beans aren't the best part. Thanks for your comment. Hi mjskit, yeah, there's a bunch of bacon in there! Although a couple of the pictures do have an extra piece for garnish. I hope you'll enjoy this dish — it's one of my favs. Thanks for stopping by. Hi Malou, can't go wrong with bacon, can you? Nor barbecue sauce, I'd say! Such a great dish - I can't wait for Memorial Day! Thanks for your comment. I do, however, used canned beans like you do and it brings back happy memories of my childhood. 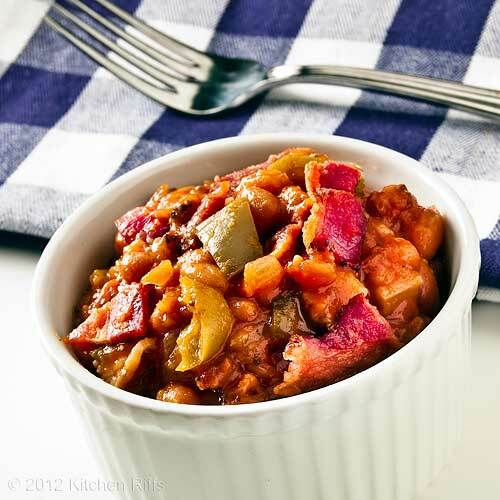 Hi Maureen, I'd love to see your recipe for Maine Baked Beans! Although canned baked beans, in this recipe, are so convenient and have such great flavor, I don't miss the real deal at all. Glad to help with those memories! Thanks for your comment. I love that this starts with canned baked beans, then makes them so much better. Definitely perfect for a bbq this summer. Scrumptious! I could eat that nearly everyday. Hi Katherine, this recipe is one of the ultimate riffs — you can create this dish around any flavor profile that you like & that fits with baked beans. A really tasty dish. Thanks for your comment. Hi Rosa, me too! It's a wonderful dish — one of my all time favorites. Thanks for taking time to comment. Hi Miss T, I do too! Thanks for your comment. I have not had baked beans for a while. The last time was probably in the UK where it was served almost every morning with toast, probably straight from the can. At home, I sometimes add it to meatballs. Yours with bacon and peppers sound wonderful. It will be great for Memorial Day cookout! Hi Biren, you'll probably like these - they have a great deal of flavor. Better than straight from the can, IMO, though I know many people really like those. Thanks for your comment. Hi Terra, they actually are hearty enough you could eat them for a meal. 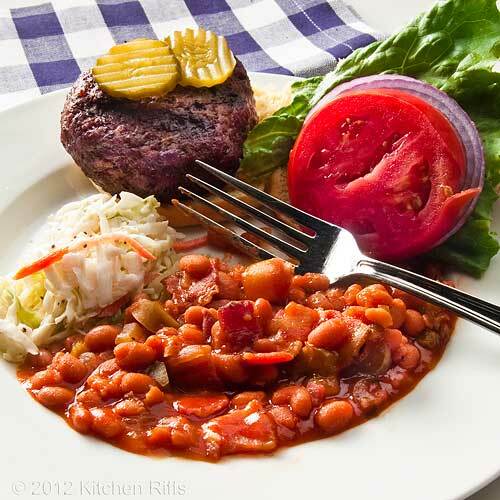 Hope you have a chance to have some baked beans this weekend! Thanks for commenting. I'm planning on making this for a work get together, but I'm hoping to make it ahead of time. Do you find it's better fresh or made a day early? Thanks! Hi Jackie, it's good either way, and actually might be a bit better made a day ahead. It reheats beautifully. Thanks, and I hope you enjoy it! Hi Chef Aicha, glad you liked it! Thanks for the comment.